Continuing with the theme of the left-behind… I do a lot of peering at branches in the winter months, after most life has gone into hiding. Sometimes some interesting discoveries can be made, affixed to (or even within) twigs or branches. I took Raven down to the 100-acre Woods yesterday, the first time we’ve gone in a little while because of hunting season (we’re in the mid-November hunting lull at the moment, but we wore our brightly-coloured jackets, just to be safe; I don’t think anyone hunts on that bit of land, but who knows what goes on there when no one’s around to see it). The forest has a fair bit of Balsam Fir scattered through the damper areas, and I paused at one clump to finger the needles, whereupon I noticed these odd little lumps amidst the foliage. There were a lot of them, mostly at the outer ends of the branches, and mostly (it seemed) on the east side of the tree (though that might just be coincidence). Determining their identity was fairly easy once home. A Google image search for “balsam fir needle galls” turned up several pages with identical galls to mine. Gotta love the forestry industry’s thoroughness; virtually anything you want to know about pests of commercially valuable tree species is available online. The pest in question here is a tiny midge, Paradiplosis tumifex, which goes by the appropriate English name Balsam Gall Midge. Eggs are laid on current-year needles as they’re growing (which explains why the galls seemed mostly to be near the ends of branches), and when the egg hatches the larvae burrow into the needle to settle down and feed. The needle forms a gall around the larva and its new home. The larva eats and grows and eats and grows, until mid-autumn when they finally break loose of their gall and drop to the ground. There, they burrow into the soil under the tree and wait for spring. Warming ground temperatures in late April and early May encourage the larvae to pupate, and a week or two later the tiny adults begin to emerge. 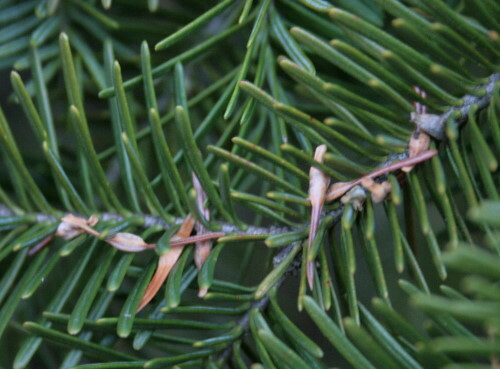 Females mate, then return to the newly-forming fir needles where they lay their eggs, and the cycle begins again. 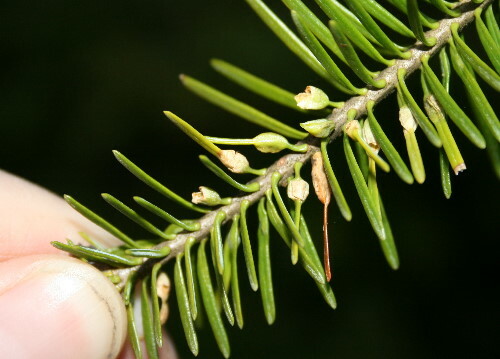 Once the larvae leave the needles in the fall, the needles brown and drop from the tree. The branches were scattered with the ones that had caught in the twigs. I noticed on the ones that were still attached to the branch that a few of them seem to be broken off; I’m not sure if this was from the midge larva emerging, or environmental damage post-emergence. The midges are no more than a nuisance, apparently; they do no long-term damage to the tree, beyond perhaps mildly stunted growth that year when under severe outbreak conditions. The galls are dropped by the winter, and even aesthetically the tree looks fine again quickly (important for the Christmas Tree market). Populations are cyclical, with two or three years of high numbers, followed by several of low. I can’t remember having noticed anything unusual about this same tree last year (it grows beside the path), and I’m not sure if that’s because numbers were low last year and high this year, or I just wasn’t looking. Galls are fascinating, I do a lot of looking about for them, too, Karen. And there are so many! I could do a weekly installment on galls and have material for years. Galls are fascinating and amazing. Oak species seem particularly entwinned with gall wasp species, and I love discovering oak apples, as they are sometimes called, here on the streets of Brooklyn, where you would least expect them. And then there’s the whole gall ink thing, a fascinating history.